19 is poped and send it as a label packet with 2 labels. Pop: The top label is removed. The packet is forwarded with the remaining label stack or as an unlabeled packet. Swap: The top label is removed and replaced with a new label. (pushed) on top of the swapped label. Untagged/No Label: The stack is removed, and the packet is forwarded unlabeled. Aggregate: The label stack is removed, and an IP lookup is done on the IP packet. This entry was posted in Cisco. Bookmark the permalink. I’m in the middle of nowhere looking for Tags Imposed means. And this great post help me a lot. 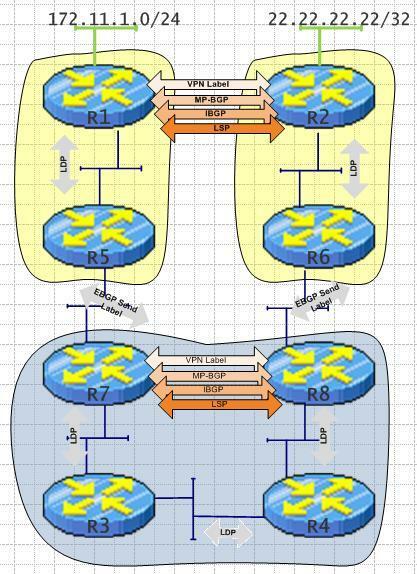 Specially your how to steps to read mpls verifications.